No, that's not true: the image has been circulating on the internet for years but it was probably originally generated using an old "Church Sign Maker" website. 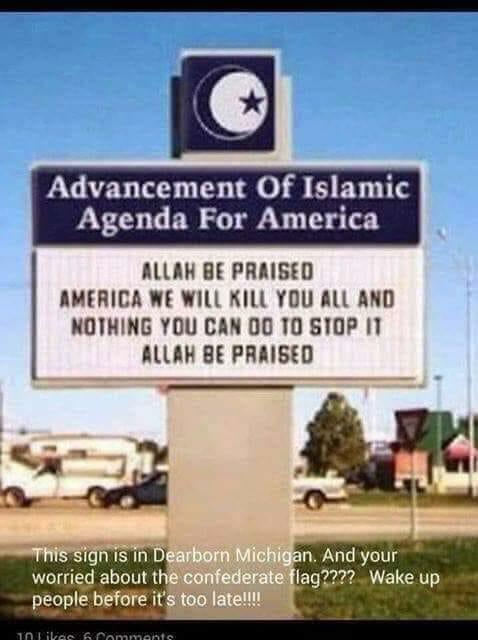 This sign is in Dearborn, Michigan. And your worried about the confederate flag???? Wake up people before it's too late!!!! Note: these church signs aren't real, they don't exist in the real world. You'll be making a fake photo of a church sign. If you want to see real church signs, look in the church sign gallery. If you want to someone to make a real church sign for you, try Stewart Church Signs.